Floor Steam Cleaner Reviews: A definitive guide showcasing some of better steam cleaners for floors and other types of floor cleaners based on price. There are many types of flooring: tile, hardwood, terrazzo, slate, marble, vinyl, carpeted and many more. However, keeping those floors clean can be a bit of a hassle. If there are kids or pets in the picture, then a messy floor is something that you would have to deal with on a daily basis. 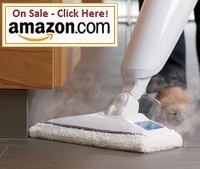 But why use a steam cleaner to clean your floors? It is a very thorough way of cleaning- sanitizes and cleans grit and grime easily since the high temperatures cut though dirt. But how do you decide on which steam cleaner to buy when you are on a budget? Money: What’s Your Budget Like? Money is definitely a big factor. How much you are willing to spend on a steam cleaner is crucial since there are many types of cleaners, all in different price ranges. Be sure to know your maximum budget before shopping for a cleaner. If you’re wondering what are the cheapest, mid-range and most expensive steam cleaners, with the best reviews, then not to worry, just have a look below to read our floor steam cleaner reviews. At around $38 it is a really affordable buy. It is a hand held steamer making it ideal for doing a variety of smallish cleaning tasks. This great little steamer is certainly not fit for cleaning floors on the whole but rather for spot cleaning spills and stains. It has a 6 oz. water tank that will supply around 10 minutes of steam cleaning after only waiting for 3 minutes to heat up. This is a steamer meant for light steaming, but at the great price – this nifty compact steamer is perfect for quick and easy floor cleaning that doesn’t a require heavy duty punch. 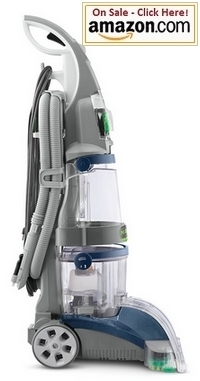 Visit the Steamfast page to learn more about these great steam cleaners. At less than $90, this is one of the better and very popular floor steam cleaners that has a high rating and numerous excellent consumer reviews. It has an overall 4.5 star rating. This cleaner has the ability to clean sealed hard wood, laminated, marble, ceramic, tile, stone and many more types of flooring. The water tank is build into the top of the mop and can be refilled anytime while your are mopping – no more waiting! It has variable steam control and can dispurse low, medium and high amounts of steam as needed for light to deep cleaning tasks. It works very well and is great value for money. Read a full review of the Bissell Powerfresh Steam Mop here. At around $182 this is one of the few steam cleaners that can clean both carpets and hard floor surfaces. Not only just clean them – but do so exceptionally well! The Dual V nozzle enables full suction across the entire length of the nozzle and it has patented SpinScrub brushes for both carpets and hard floors work together to clean dirt out of your floors or carpets. Not only does it have the power, but also the reach – a 30 foot cord. This model is well known for it cleaning efficiency and ability to extract water out from carpets for deep cleaning action. It can be a bit noisy and there are a few complaints that the plastic parts have a tendency to break easily. With every steamer, there will always be the upside and downside. However, if this is huge concern, you may want to consider the Hoover SteamVac with Clean Surge which has a high carpet steam cleaners rating. Note that this model is only designed for carpets but many owners have reported that it also cleans hard surface floors quite well. However, this model was not originally made for that purpose. The cost of this cleaner starts at around $182.00 and has an excellent consumer rating, it is well worth the price tag. Learn more about the Hoover steam cleaners here. For particular types of floors you might want to get steamers that are suited to those floors, i.e. a Hardwood floor steam cleaner or a Tile Steam Cleaner. Visit the Best Steam Cleaners page to read more about the best steamers.